**** Chosen by Winner: Robert N.
This Gunhammer model sports a radian recurve style blade with a titanium frame lock handle. The Kizer Gunhammer breathes new life into the popular and proven Darrel Ralph custom design. It has the heavily textured 3D machined titanium handles that are the hallmark of the Gunhammer series, contoured to fit snugly in any size hand. The utilitarian blade shape provides a versatile tool for EDC, utlity, or defense. It has a flipper and dual thumb stud openers for quick draw times. Experience a legendary Darrel Ralph design with the dependable Kizer Gunhammer. 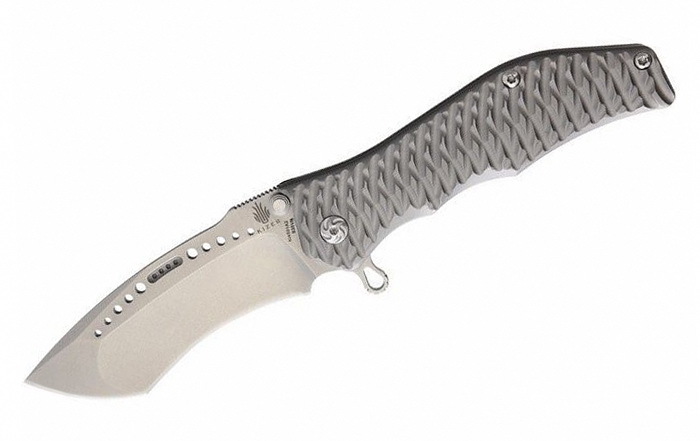 3D machined titanium handle provides a high performance grip in bare or gloved hands. Dual thumb studs and a blade flipper offer ambidextrous blade deployment. CPM-S35VN steel for a tough cutting edge with excellent edge retention.